Amir Alishahi & Associates, P.C. was founded in 1991 to represent and assist individuals, corporate entities, businesses and institutions in all types of real estate transactions with our central focus in purchases and sales of residential houses, condominiums, cooperative apartments and multi-family properties in Manhattan, Brooklyn, Queens, Staten Island, and the Bronx. 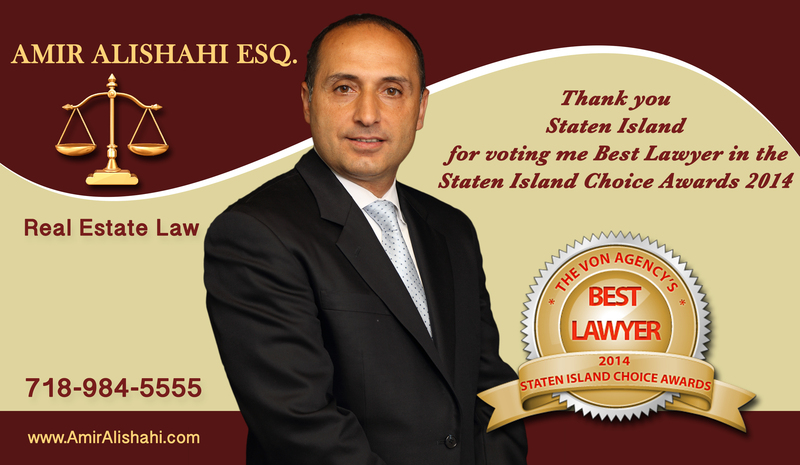 Our Staten Island real estate lawyers have extensive experience and a thorough understanding of real estate law which enables us to provide our clients with legal services of the highest quality. Amir Alishahi & Associates, P.C. uses extensive experience with real estate professionals in New York and New Jersey to select the best brokers, surveyors and consultants for your needs. Working with individuals, businesses or other organizations, our Staten Island real estate lawyers will do their due diligence in every type of real estate transaction.